My husband Doug and I have been married for over 48 years. We love to walk together. He has long legs and took great big steps, and I used to have trouble keeping up with him. He also walked very fast. We knew something just didn’t seem right when he started to slow down and I would have to wait for him. He had lost strength and even the expression on his face stopped changing… Finally we found our way to a neurologist for help. 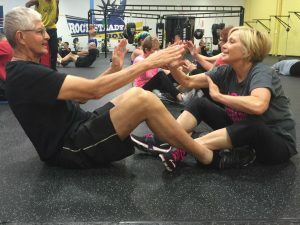 After a lot of testing, Doug was diagnosed with Parkinson’s disease and his doctor recommended Rock Steady Boxing. We have always been active. We have exercise equipment in our home and our dog is even trained to walk on the treadmill with Doug. We thought we were okay and in pretty good shape. But, the neurologist was persistent. He kept after us to go to RSB. We had no idea at the time that this was going to change both of our lives! RSB encourages the spouses (or “Cornermen,” as they call them here) to participate in the classes right alongside their boxer. I didn’t think I needed this. Boy, did I get a surprise! Our Rock Steady Coaches have been so supportive and encouraging – to both of us. The RSB classes push us more than we would ever do on our own. And what’s even better – the other boxers and their “Cornermen” have encouraged us every step of the way and become our new friends. These friendships keep you from feeling like you’re all alone in your battle with Parkinson’s. After just a few months of classes, our friends and family members are commenting on how much better Doug is doing. He is stronger, more engaged in life, and even smiling a bit here and there. His blood pressure has stabilized and his doctors are so encouraged and amazed with his progress they have started spacing his appointments farther and farther apart. I am also getting a lot stronger, and even my balance has improved! We didn’t know how much we needed Rock Steady Boxing. Thanks to Rock Steady both of ushave a more positive outlook on our future.